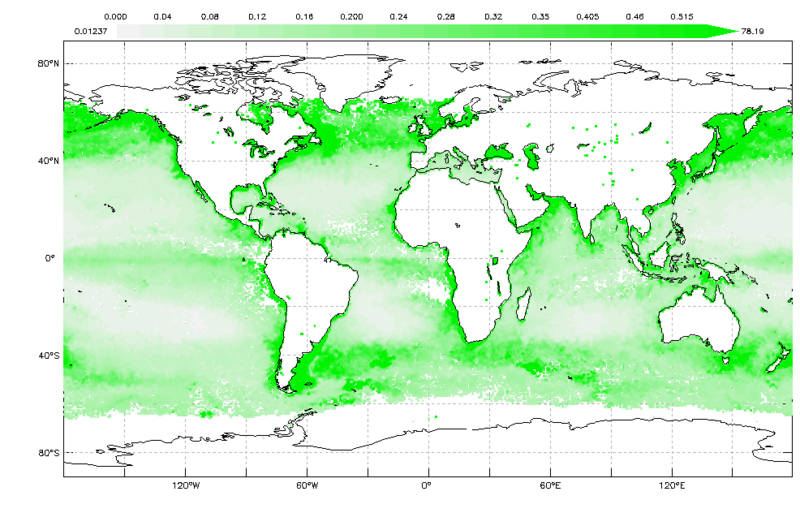 Tiny plants called phytoplankton grow in the sunlit waters of the ocean's surface. Like all plants, phytoplankton contain chlorophyll, a pigment that transforms sunlight into energy the plant can use. This same pigment gives phytoplankton their greenish color. Chlorophyll absorbs most visible light but reflects some green and near-infrared light. 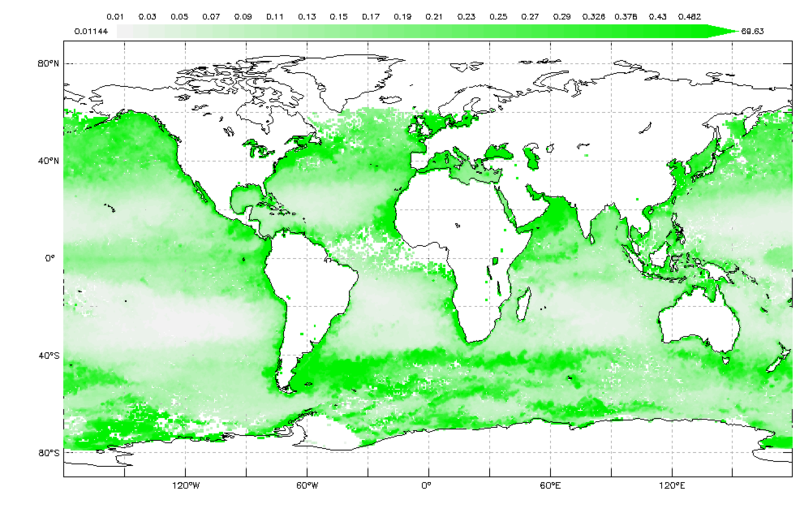 By measuring what kind of light is absorbed and reflected, the MODIS sensor aboard NASA's Aqua satellite can measure chlorophyll concentrations in the ocean. 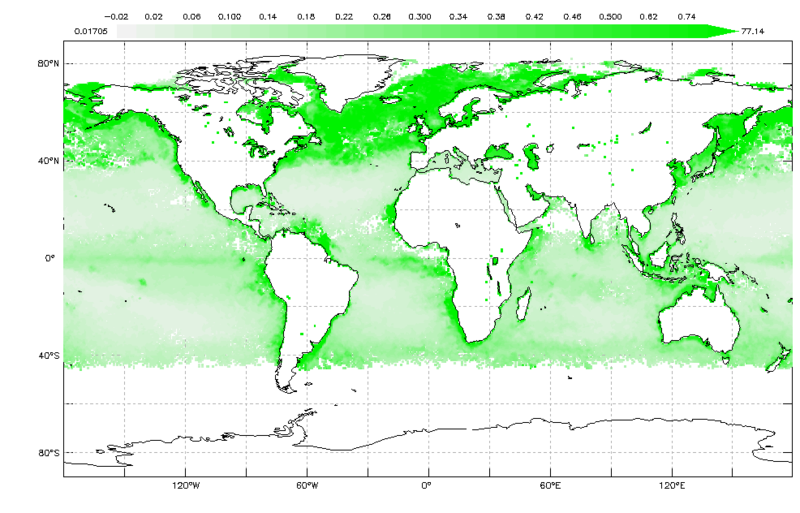 Scientists use measures of chlorophyll concentration to determine the abundance of plants near the surface of the ocean. Chlorophyll measurements give scientists valuable insights into the health of the oceans' environment. Most phytoplankton blooms are a sign of good health, such as the large blooms occurring every spring in the North Atlantic Ocean. Other blooms can point to problems developing in the ocean--such as harmful algal blooms. Even if the blooming plant itself is not harmful, as billions of phytoplankton die and decay over a span of days, they can rob the water of oxygen, creating "dead zones" where fish and other marine organisms cannot survive. Chlorophyll concentration measurements are also important to scientists studying Earth's climate system. As phytoplankton grow, they take in carbon dioxide during photosynthesis. Carbon dioxide is a greenhouse gas that traps heat near the surface of the Earth. As carbon dioxide accumulates in the atmosphere, the Earth's temperature could rise. Conversely, larger and more frequent phytoplankton blooms could draw down more carbon dioxide into the ocean and help cool our planet. Knowing how many plants live on the surface of the ocean helps scientists estimate how much carbon dioxide the plants absorb. 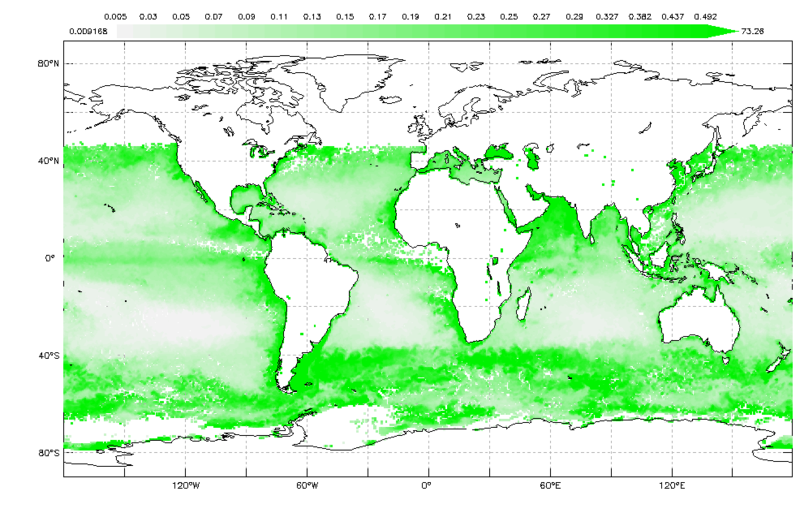 Thus, maps of chlorophyll concentration are helping scientists better understand the role that phytoplankton play in Earth's climate system. Goal: Students observe seasonal images of Seasonal Chlorophyll Concentrations, looking for any changes that are occurring throughout the year. Have students put the images in (what they predict to be) their correct chronological order. What differences, if any, do you find between the year’s variations over the coastal versus the year’s variations over the open oceans?